A system with Distributed Generation (DG) has greater load carrying capacity and can correct for a poor voltage profile during peak loading. 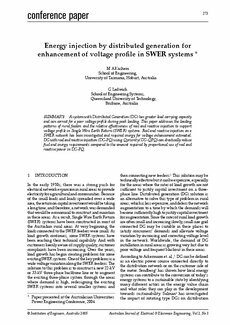 This paper addresses the loading patterns of rural feeders and the relative effectiveness of real and reactive injection to support voltage profile in Single Wire Earth Return (SWER) systems. Real and reactive injection on a SWER network has been investigated and required energy for voltage enhancement estimated. DG with real and reactive injection (DG-PQ) using Q priority (DG-QPQ) can drastically reduce fuel and energy requirements compared to the amount required by proportional use of real and reactive power in DG-PQ. © Institution of Engineers,.